Fig. 3. Frank-Starling relationship. As the end-diastolic volume increases, the cardiac output also increases. Excessive preload may eventually result in decreased cardiac output. Fig. 4. Effect of acutely increasing preload on the pressure-volume loop. Increasing preload while maintaining normal afterload and contractility results in increased stroke volume (SV*). e, contractility line; SV, stroke volume. Fig. 5. Effect of ventricular failure on the pressure-volume loop. In heart failure, the myocardium compensates its inability to contract by increasing preload in an attempt to maintain stroke volume. Excessive preload eventually leads to worsening of heart failure. 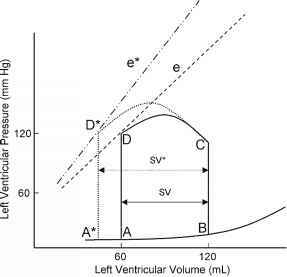 e and e*, contractility lines; SV, stroke volume. Fig. 6. Effect of acutely increasing contractility on the pressure-volume loop. Increasing contractility while maintaining normal preload and afterload results in increased stroke volume (SV*). Note the increased slope of the contractility line (e*). The area of loop D* is larger, indicating greater myocardial work per stroke volume. e and e*, contractility lines; SV, stroke volume. Preload is determined by the end-diastolic ventricular volume; it is determined by passive and active emptying of the atrium into the ventricle. Factors that affect this relationship, such as mitral stenosis and ventricular hypertrophy, will affect preload. 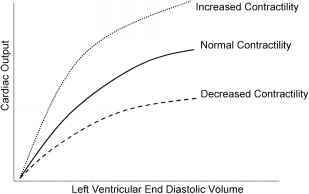 The Frank-Starling curve displays the relationship between preload and stroke volume; as end-diastolic volume increases, the stroke volume increases until the end-diastolic volume becomes too excessive to allow proper ventricular contraction (Fig. 3). A pressure-volume loop also displays the relationship between preload and stroke volume (Fig. 4). 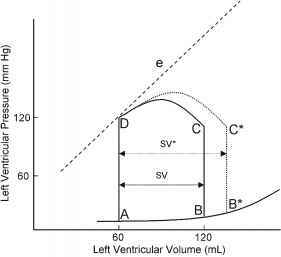 Preload is the volume of blood in the ventricle at the end of diastole (point B in Fig. 4). 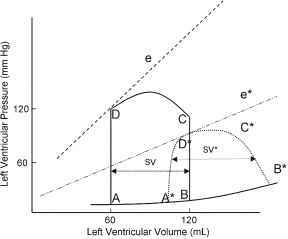 An increase in preload is displayed by a right shift of the end-diastolic volume curve (A-B* in Fig. 4). In a normally functioning ventricle, an increase in preload while maintaining normal contractility and afterload results in increased stroke volume (SV* in Fig. 4). Excessive preload will not continue to result in increased stroke volume. 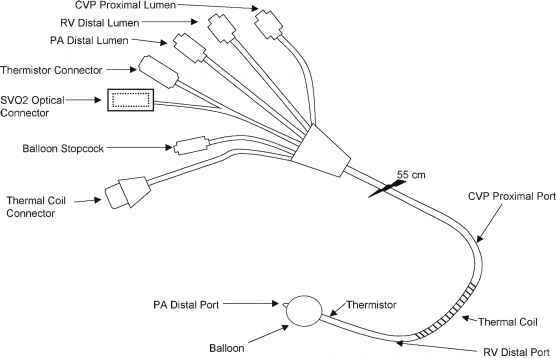 Excessive overdistention of the ventricle may result in heart failure (Fig. 5). ward. Increased myocardial contractility forces more blood out of the ventricle during systole, which is displayed by a lower end-systolic volume. Note the change in SV* (Fig. 6) with increased contractility; the end-systolic volume is lower because of increased contractility, resulting in increased stroke volume. With increased myocardial contractility and unchanged preload, the resulting pressure-volume loop shifts to the left, maintaining normal stroke volume. An increase in contractility is graphically displayed by the increase in the slope of line e* in Fig. 6. During ejection, the myocardium contracts from C to D* (Fig. 6). During conditions of lower end-diastolic volume, a normal stroke volume may be maintained by increasing contractility. Administration of inotropes such as dopamine and epinephrine will increase contractility, which assists in maintaining adequate stroke volume during low-contractility states such as heart failure and/or cardiogenic shock. The increase in preload moves the myocardium up the Frank-Starling curve. By increasing end-diastolic volume, normal stroke volume may be maintained. The increase in preload and worsening heart failure eventually lead to ventricular dilation and venous congestion. During heart failure, sympathetic tone increases as levels of circulating norepinephrine and epineph-rine attempt to maintain normal cardiac output by increasing contractility and heart rate. 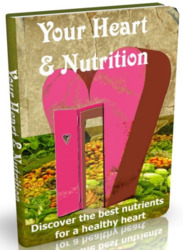 The body's compensatory mechanism for heart failure may eventually become counterproductive and thus even worsen the situation. How is cardiac output affected by epinephrine? How epinephrine increases cardiac output? How does adrenaline increase stroke volume? How does Sympathetic stimulation and epinephrine effect stroke volume? How to increase epinephrine cardiac output? How does adrenaline support cardiac output? How does epi affect preload? How is cardiac output effected by epinephrine? Does epinephrine increase end systolic volume? How would epinephrine end diastolic volume? How does adrenaline work to increase cardiac output? What happens to stroke volume after epinepherine? Does increase in bloodborne epinephrine increases stroke volume?